Hello there! It’s been 2 months since my last post, and I am ashamed. But why waste time feeling guilty? It is, after all, a new year. And January is a time for forgiving yourself and making new resolutions. I’m not one of those who say new resolutions are a waste of time because they’ll be broken by February, or that the new year is an arbitrary date and is therefore meaningless. I like the idea of a reset button, of evaluating your life and deciding what it is about yourself you want to improve, and where you want to be by this time next year. Shout-out: A recent trip back home gave me a greater appreciation for friends who took the time to catch up with me. Childhood friends like Sasee (macha!) and Jun Wei, who so reliably say yes! whenever I propose a meet-up, and the (almost) countless Monash Christian Fellowship friends who still feel like family despite having been scattered across different jobs, states and countries in my 4 years since graduation. MCF-ers: I love how we attend each other’s weddings, keep tabs on each other, rejoice over the birth of each other’s kids (welcome to the world, Kieran! ), and take the time for the occasional makan sessions. I wish I could name all of you, but our family is so big that I’d be sure to leave somebody out. To give you a picture of how little Bible I’ve read this year: according to my YouVersion Bible app, I’m currently at day 88 of a 365-day plan, which I started in July 2015. That means I’ve missed 6 months of Bible-reading. 6 months. And my frequency of prayer is even worse. Yep. And we’re talking every season of each show. That’s an average of 5 seasons per show and a total of 20 shows, with maybe an average of 15 episodes per season = 1500 episodes. Holy molé! I’ve tried to make these as specific and sustainable as possible. No. 4 has to do with my latest hobby: photography! Hubby and I bought a DSLR on Cyber Monday, and I’ve been having fun learning about exposure and composition. I’ll write more about this new interest and Project Life in the next post. Hoping against hope that jamming devices won’t be used at the rally today, I’ll be live-blogging my experience at Bersih 5.0. Refresh the page every now and then for live updates. I made the snap decision to attend the rally on Thursday. 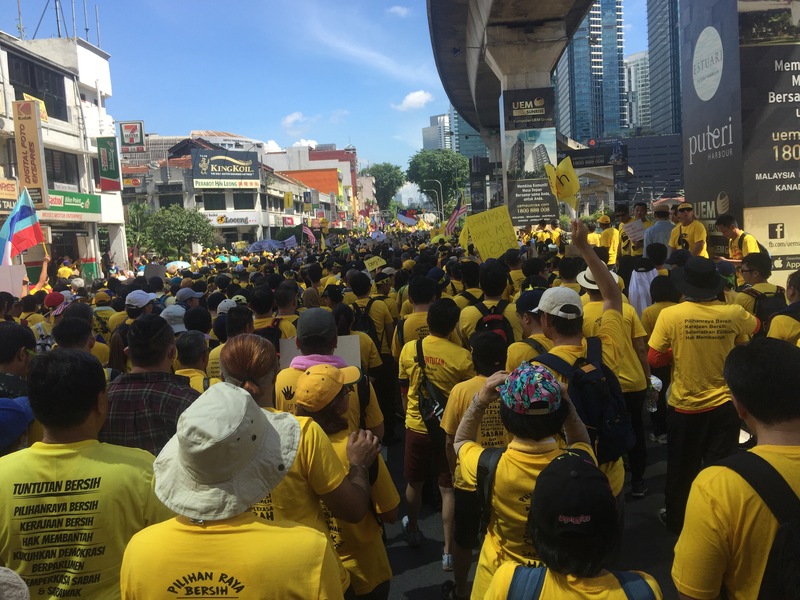 Bersih wasn’t very present in my consciousness this time around, but every time I saw an article or Facebook post about the red-shirts and yellow-shirts, I’d think to myself: Should I go? I didn’t know any of my friends who were going, and the last rally was hot and exhausting. The tipping point came when a Grab uncle told me he was going for Bersih. He didn’t say much, but sitting there, suddenly, I knew. 9.30am: As we wait for the rest of my group to arrive, a friend tells me of test-driving a car with a red shirt salesman. “How much they paying you?” my friend asked. “RM50.” “Don’t you think it’s a bit small? You should think more long-term,”. His reply: “Life is hard.” My friend’s wisdom: If someone takes RM100 from you and gives you 50 cents, are you going to thank him? 9.46am: My friends and I board the LRT at Kelana Jays. As we enter, we’re greeted by cheers and applause by fellow rally-goers coming from Subang. 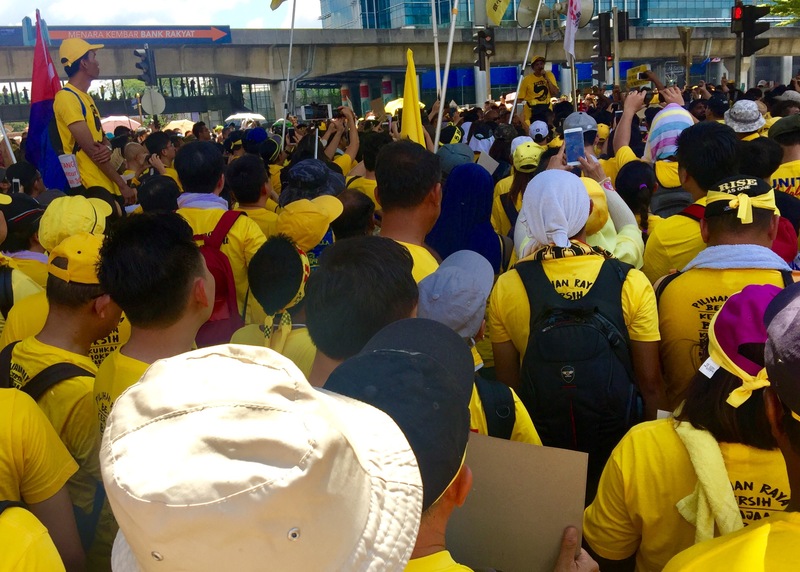 10.00am: Bangsar LRT (one of two meeting-points) is a sea of yellow. 10.56am: I spot a few LGBTQ rainbow flags in the crowd. It’s a group that call themselves Queers United for Equality and Electoral Reform. Above a huge Q.U.E.E.R. banner, a man holds up a sign: TANGKAP Pencuri- MO1. Kebajikan 30 juta rakyat Malaysia mesti diutamakan (ARREST Thief – MO1. The welfare of 30 million Malaysians should come first). 11.04am: The Internet’s slowed down considerably. I decide to give up trying upload photos and instead burn through my phone battery trying to upload my updates. A friend points out a banner hanging from an overhead bridge that I hadn’t noticed: A large portrait of Anwar Ibrahim bearing the words: Kehadiran Saudara-Saudari Akan Membantu Menjana Perubahan di Negara Malaysia Tercinta (Your presence will help generate change in our beloved country of Malaysia). This reminds me of a conversation I had last night with a friend over dinner, about how Bersih is becoming more and more partisan. 11.25am: We’re seated along the highway, waiting for a signal from the front that we can start our march. A guy using a megaphone talks forcefully to the crowd, but he’s too far away to hear clearly. Sporadic chants of “Bersih! Bersih!” (Clean! Clean!) break out from the crowd. Someone begins handing out salt in case of tear gas. I decline, deciding to rely on my swimming goggles and bottle of water. 11.30am: We begin the march! “BERSIH!” “Hebat!”(Clean! Power!”) A little old lady standing on a box instructs us through a microphone to remember that 1pm is prayer time. That’s so cool. 12.33pm: We’d minced forward 1 kilometre when we met a line of purple-shirted security guards, who asked us to halt. Word on the street is that the FRU is ahead of us, preventing us from converging at Dataran Merdeka. We’re told to leave a space in front of us in case those ahead are forced to retreat. It will be at least a half an hour wait under the hot sun as the organisers negotiate our passage with the authorities. 1.21pm: Something seems to be happening. A few people run towards us from the direction of the blockade. In a Lord-of-the-Rings-type moment, we hear them say, “The FRU are coming!” An ambulance, sirens blaring, drives past. A pause. Nothing happens. We resume our wait, but are now watchful. 1.30pm: “Let’s go take a picture of the FRU,” says Danny. 2.10pm: Malaysian-style, we decide to take a break from the protest and head into Little India in search of food. 2.23pm: We wind up having lunch at Nu Sentral, a mall attached to the transportation hub. The air-conditioning is a welcome relief, but it also makes me more aware of my pounding head, flushed cheeks and sweaty clothes. The food court is full of yellow-shirts taking a break. As we eat, we receive news through the Bersih online stream that the rally’s venue has been changed to KLCC. I am relieved; KLCC is a couple of train stops away. 3.10pm: Had a scoop of Haagen Dazs while waiting for a latecomer to join us. Because, you know, there’s ARFI. 3.33pm: We board an LRT headed to KLCC. 4.08pm: We join the throng gathered in front of Public Bank. There are so many people that we can’t get close enough to the stage to hear the speeches. The crowd sounds a little ugly as those at the back holler at a line of people standing up and blocking the view. 4.30pm: The sky is overcast and the air smells like rain. The three of us (we split from the main group a while ago) decide to head back to avoid a crush. Unfortunately, so does everyone else. At the top of the escalator leading down to the station, we are hit by a heat wave from all the bodies tightly crammed together. We left the sauna and decide to try another station. So do a lot of people. 5.11pm: We get into an Uber. The driver asks permission to go and salam YB Zuraidah, who had been 5 minutes behind us the whole time we were waiting. To think! If I weren’t so tired I’d get out and salam her too. 6.00pm: Traffic was surprisingly clear. I arrived home, took a shower, and tried to sleep off my headache. Why did I? I knew from the past experience that the rally would be uncomfortable and hot, with long periods of slow walking and sitting around. I was under no delusions that our corrupt politicians would look at our protests and say, “Alright already. We hear you. We’ll stop rigging elections and stealing your money.” I went not because I thought it would change anything, but because I wanted to let them know that I’m not okay with their crap. I went not because I thought it would change anything, but because I wanted to let them know that I’m not okay with their crap. The Malaysian headlines have been so painful to read that it’s been a relief to be distracted by the U.S. elections. Our politicians are constantly saying things that make my blood boil. Amidst the anger, frustration and disbelief that too frequently accompanies my perusal of Malaysian news is an overwhelming sense of helplessness. I can’t see what we could possibly do to rid our country of corruption and achieve a true democracy. Though more than half of the American population was bitterly disappointed at the outcome of the elections, I would readily swap places with them. Their votes actually count, and their leaders respect the outcomes of their elections. Without free and fair elections, what’s a Malaysian to do? 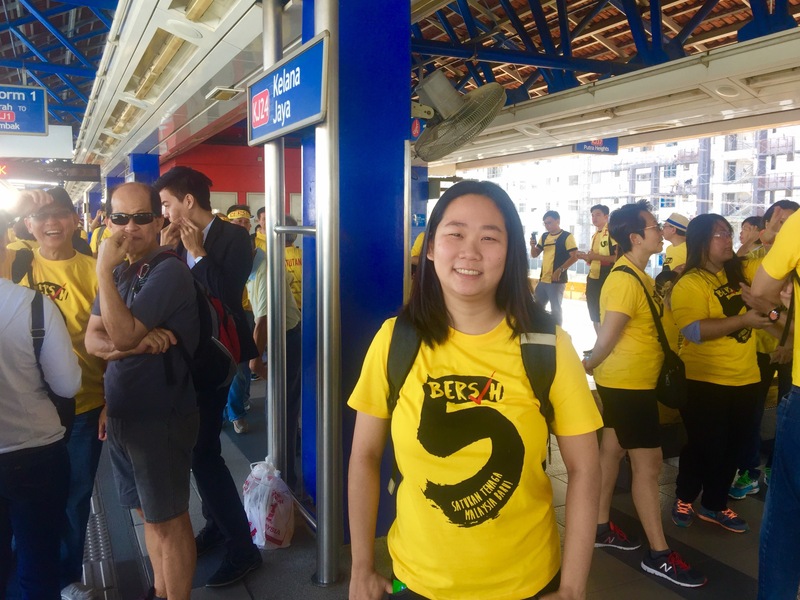 Attending the Bersih 5.0 rally was at least a step up from griping about our state of affairs to my husband. At the very least, I get to play a small part in changing our headlines for a day. It’s nowhere near enough, but it’s something. This post was brought on by a recent high school reunion of sorts. Familiar faces from a decade ago sent me spiraling into a nostalgic funk. Out came The Ataris, and with it, a tide of emo. The Ataris has such strong nostalgic powers for me that I generally avoid listening to their music for fear of triggering a mild case of saudade*. One particular number, “San Dimas High School Football Rules” is guaranteed to make me feel fifteen again. I think it was the first song (of very few, admittedly) I ever performed in front of an audience. The year was 2003. The venue, a prefects’ high tea at a very cheap hotel. The band, a boy a year older (remember what a big deal that was in high school?) who was slated to become my best friend for a couple of years, and his friend (I don’t remember which one). I remember singing the lyrics, which have stuck with me ever since, into the mic, and looking at a sea of faces I’m sure couldn’t catch what I was singing. I wore my sister’s long red skirt and a lycra black top decorated with rhinestones. I felt so cool. That was the only time we performed together, but that song marked the beginning of my introduction to the world of indie music, courtesy of the older guy, and all that implies when you’re in your teens. I stopped rushing to my room at midnight on Fridays to record Rick Dees and the Weekly Top Forty, and dived into the wealth of mix cd’s my new friend made for me. The Shins, Deathcab for Cutie, Iron & Wine, Belle & Sebastian all became the music of my soul, making me feel emo like I had never felt emo before. Had HitzFM been denying me this cathartic experience? Or was this just puberty? The Ataris, being among the first in a long line of mix cd’s, received the most airplay. They were playing as I studied for the PMR and SPM (10th grade and 12th grade exams, respectively). They were in the mp3 player I shared with a crush, one earphone each. They were the soundtrack to a surprise birthday party I threw for a friend. Here are other memories that come to mind when The Ataris plays. Sitting in the neighbourhood basketball court at night with friends, feeling grown-up because I’m out so late. Talking on the phone for hours at the top of the stairs when my parents were out for cell group. Sharing secrets and junk food into the wee hours of the morning. Walking like I owned the school. Feeling like I could do anything. More than any other band, The Ataris brings back my high school days. I listen to them rarely, almost against my will, because they remind me of the friends I used to be close to. We grew up, we scattered across the globe, we were content with adding each other on Facebook. Spotify mixes my playlists now, and I lost my mp3 player a long time ago. There’d be no distance that could hold us back. In Malaysia, no single question annoyed me more than “You don’t speak Chinese? You’re not Chinese ah?” I’ve had to deal with this sort of thing ever since I could toddle, and it infuriates me. Ironically, it was anti-bananaism that made me the banana I am. See, when I was little, my relatives used to put me down for not knowing Chinese. I remember an aunt once calling me “stupid girl” in Cantonese because I couldn’t understand what she was saying. Experiences like that combined with scary kindergarten Chinese teachers ingrained in me a deep aversion to the language. As a result, I cried for days when I learnt that I had been enrolled into SJKC Chung Hwa at 7. My parents tell me I wouldn’t stop crying until I was pulled out and enrolled into a kebangsaan (Malay-medium) primary school instead. Much of my aversion towards the language has been done away with by non-judgemental Chinese-speaking friends, and if I could go back in time I would have stuck it out at Chung Hwa, if only to spare myself the irritation of dealing with “You’re not Chinese ah”? While I still haven’t encountered a more annoying question than that (and I doubt I ever will, unless it’s the more racist variation: “You don’t speak Chinese? Are you Malay?”), here are a few I’ve encountered in the U.S. that, while don’t come close on the racism scale, are still pretty annoying. You’ve only been here a month? Wow! Your English is really good. Uh…thanks? My objection to this one isn’t just “Malaysians speak English too, you know!” because technically, a majority of us don’t. What bothers me about this question is the implication that English belongs to the Americans. English is as much my first language as it is theirs, and I love it, and I resent the implication that I’ve done really well to master it when I’m not American. You know English is spoken all over the world…don’t you? You’re 28? Whoa you look, like, 15. Oh, stop it you. It’s an Asian thing. I guess this one isn’t really racist. But you get tired of it after a while. And anyway, isn’t it supposed to be taboo to ask women their ages? Not if you thought I was 15, I suppose. Curse you, Asian skin! So do you plan to stay here [forever]? Some people ask this out of genuine interest; they want to know what I plan to do after hubby and I finish our studies. There’s a type of person though (mostly Uber/Lyft drivers) who, when they ask you this question, ask as if they expect the answer to be yes, of course, because who wouldn’t want to live in the U.S.? Especially if you come from [insert Asian country here]. Come to think of it, I’ve gotten that vibe from Malaysians too. With our daily headlines, I guess I can understand the sentiment. But guys: while the grass may seem greener here, they don’t have durian trees. And movie tickets cost, like, 12 USD each. So have you been to Chinatown? Yes. Have you? Variations on this theme include: You must go to Chinatown a lot, and, do you cook Chinese food? p.s. I’ll be back in Malaysia for two weeks starting next Thursday. If you want to catch up, call me!